Just a quarter of Americans (25%) say they have a favorable opinion of Congress, while 70% have an unfavorable view. 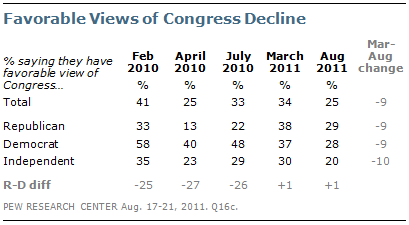 This is among the lowest favorable ratings for Congress in more than two decades of Pew Research Center surveys. The number expressing a favorable opinion of Congress has fallen by nine points since March (from 34% to 25%), with nearly equal declines among Republicans, Democrats and independents. Democrats have much less favorable opinions of Congress than they did last year, when their party controlled both the House and Senate. In July 2010, for instance, nearly half of Democrats (48%) had a favorable opinion of Congress; that compares with just 28% in the current survey. Republicans’ views of Congress became more positive after their party won the House in last fall’s midterm. In March of this year, 38% of Republicans felt favorably toward Congress, up from 22% in July 2010. But the percentage of Republicans with favorable opinions of Congress has fallen to 29% in the new survey. The public also continues to express highly negative views of the way congressional leaders from both parties are handling their jobs. Just 22% approve of the job performance of Republican congressional leaders; 69% disapprove. 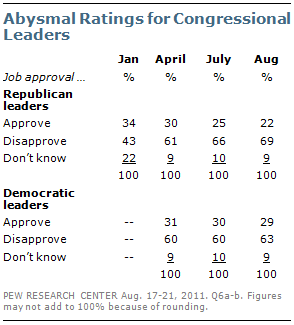 The approval rating for Democratic leaders is not much better (29% approve/63% disapprove). Ratings for GOP leaders have fallen sharply among the Republican base – and the change has been particularly dramatic among Republicans and Republican leaning-independents who agree with the Tea Party. Among all Republicans, 46% now approve of the job performance of Republican leaders, down 23 points from January. In January, Republicans and Republican leaners who agree with the Tea Party approved of GOP leaders’ job performance by an overwhelming 74% to 9% margin. Today, just 37% of Tea Party Republicans approve of the way Republican leaders are handling their jobs while 59% disapprove. In the past month alone, following the debt ceiling agreement between President Obama and Republican leaders, the approval rating for GOP leaders has fallen by 14 points – from 51% to 37% – among Republicans and Republican leaners who agree with the Tea Party. 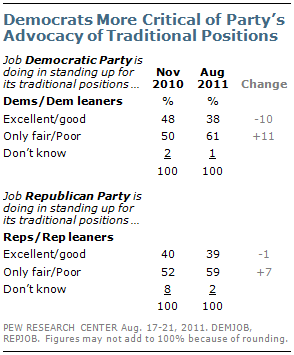 Both political parties also are viewed less favorably than they were earlier this year. But the decline in the GOP’s image has been more pronounced: Currently, 34% say they have a favorable opinion of the Republican Party while 59% view the GOP unfavorably. The percent expressing an unfavorable opinion of the Republican Party has risen by 11 points (from 48%) since February. The current balance of opinion toward the Democratic Party also is unfavorable (43% favorable vs. 50% unfavorable). In February, about as many said they had a favorable (47%) as unfavorable (46%) opinion of the Democratic Party. 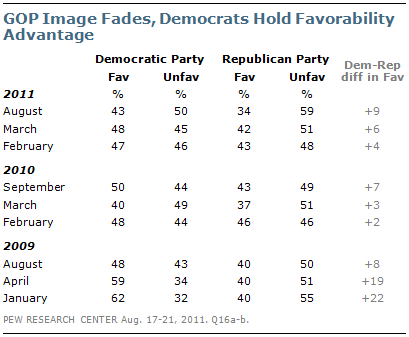 Still, the Democrats are more viewed more favorably than the GOP (43% to 34%). The Democrats’ advantage is far narrower than at the start of the Obama administration. In January 2009, 62% said they had a positive view of the Democratic Party compared with just 40% who said the same about the GOP. Just 29% of independents now have a favorable opinion of the Republican Party, while 63% have an unfavorable view. 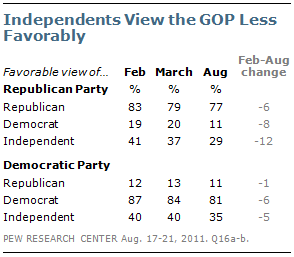 The percentage of independents holding a favorable view of the GOP has declined by 12 points, from 41% in February. While job approval ratings for GOP leaders have declined among Republicans (particularly those who agree with Tea Party), Republicans continue to express favorable overall views of their party. More than three-quarters of Republicans (77%) express favorable views of the GOP, which is largely unchanged from February (83%). However, Republicans and Republican leaners who agree with Tea Party have a less favorable view of the GOP than they did in February (68% today, 81% in February). Democrats express fairly positive views of their party’s congressional leaders – 53% approve of their job performance. But Democrats are increasingly critical of the party’s advocacy of its traditional positions, such as protecting the interests of minorities, helping the poor and needy and representing working people. Currently, just 38% of Democrats and Democratic leaders say the party is doing an excellent or good job of standing up for its traditional positions; 61% say the party has done only a fair or poor job. Last November, following the party’s dismal showing in the midterm elections, Democrats and Democratic leaners expressed more positive views of how well the party was standing up for its traditional positions (48% excellent or good/ 50% only fair or poor). Republicans and Republican leaners currently give about the same negative evaluations as Democrats of their party’s advocacy of its traditional positions – in the GOP’s case, on such things as reducing the size of government, cutting taxes and promoting conservative social values. Only about four-in-ten Republicans (39%) give their party excellent or good marks, while 59% say it has done only a fair or poor job. That represents little change from November 2010 (40% excellent/good, 52% only fair/poor). With still more than a year to go before the 2012 elections, voters are divided in their vote for Congress: 48% say if the election were held today they would vote for the Democrat in their district or lean Democratic, while 44% say they would vote for the Republican or lean Republican. Notably, independent voters, whose support for Republicans was critical in their 2010 midterm victories, are now evenly divided: 44% favor the Republican candidate or lean Republican in their district and virtually the same percentage (42%) say they would vote for the Democrat. Republicans and Democrats both overwhelmingly say they will vote for their party’s candidates. And while Tea Party Republicans have become more critical of GOP congressional leaders, 98% of Republican and Republican-leaning voters who agree with the Tea Party plan to vote for the Republican candidate in their district. The Tea Party has become much better known since the beginning of last year. 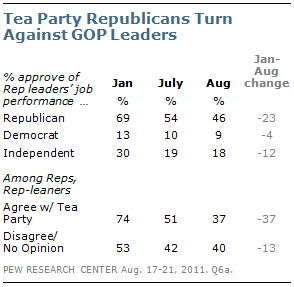 And as the Tea Party has become more familiar, its image has grown less positive. In the new survey, 36% say they have a favorable opinion of the Tea Party movement while 43% have an unfavorable view; 20% are unfamiliar with the Tea Party or express no opinion of the movement. In February 2010, about the same percentage as today (33%) had a favorable opinion of the Tea Party but just a quarter (25%) had an unfavorable opinion; far more (42%) were unable to rate the Tea Party. 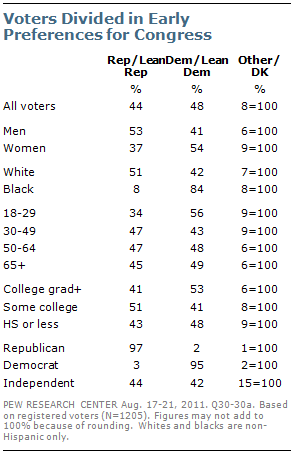 In February 2010, college graduates were evenly divided in opinions of the Tea Party (34% favorable, 32% unfavorable). Today, about the same percentage of college graduates has a favorable opinion (32%) while 58% say they have an unfavorable impression. 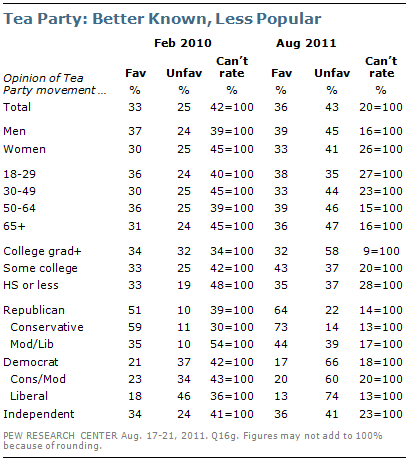 Opinions about the Tea Party have shown less negative movement among those with less education. Among independents, unfavorable opinions of the Tea Party have increased by 17 points (from 24% to 41%) while favorable opinions are largely unchanged (36% today, 34% then). Conservative Republicans are one of the only groups in which favorable views of the Tea Party have increased since early last year – 73% have a favorable opinion now, compared with 59% then. Unfavorable opinions among conservative Republicans have not increased over this period (14% now, 11% then). The public continues to be divided over whether Republican leaders in Congress are paying too much, the right amount or too little attention to the Tea Party. Currently, 30% say GOP leaders are paying too much attention to the Tea Party while about the same percentage (31%) says they are paying too little attention to the Tea Party; 20% say they are giving the right amount of attention to the group. These views are little changed from early April (27% too much, 32% too little, 23% right amount).